I wish God would lead through emotion. Hearing his voice would be effortless if it was simply the same as the voices in my head. All I would have to do to hear his voice would be to ask, "Is this what I want? Am I excited about this? Yes? Must be God!" or, alternatively, "Am I worried? Afraid? Too tired to continue? Must mean it's time to give up." That's not how it works, though, is it? God's voice isn't always contrary to emotion but neither is it always the same. Distinguishing God's voice from the noise, desires, and emotion in my heart takes work: spiritual work. It takes perpetual conversation with him through prayer and regular time devoted to reading the scriptures to become familiar with his voice. To know it well enough tat I can confidently identify it among the constant chatter that surrounds me. When [the shepherd] has brought out all his own [sheep], he goes on ahead of them, and his sheep follow him because they know his voice. But they will never follow a stranger; in fact, they will run away from him because they do not recognize a stranger’s voice. 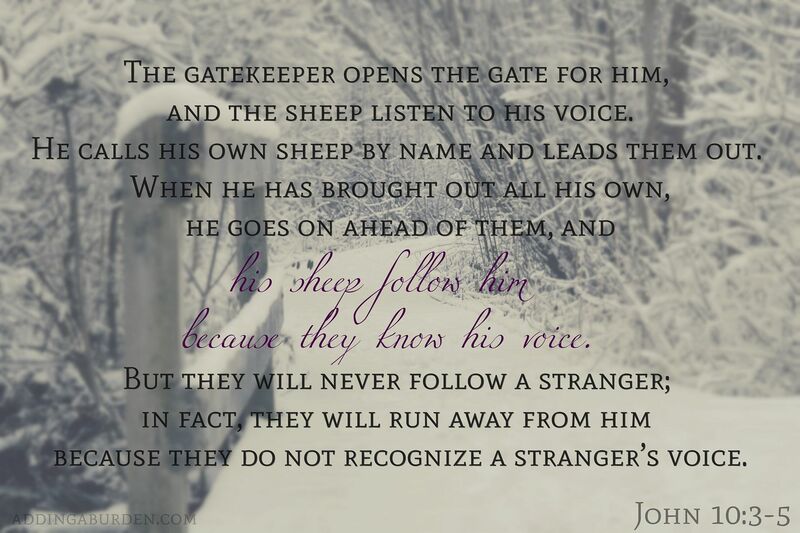 In this story the "stranger" the sheep refuse to follow isn't just a random guy, some fill-in from a temp agency or whatnot... the "stranger" is a thief, a robber. He is someone who has come to the sheep to "kill and destroy" (vs 10). This stranger is all the noise around us that wants us to be scared, self-absorbed, mean spirited or envious, among other things. This stranger is all the voices that lead to spiritual death. The shepherd, on the other hand, wants nothing but the best for his sheep. His job is to protect the sheep and lead them to green pastures. His is the voice that leads us not only to life but life "to the full" (vs 10). As John and I have been slowly approaching our February frozen embryo transfer, the "stranger" has been speaking fear into my life. Fear of hoping in vain, fear of another failure, fear of loosing two more precious lives, barely begun. Fear. I thank God for the gift of his scriptures because through them I know this truth: "God gave us a spirit not of fear but of power and love and self-control" (2 Timothy 1:7). Now it is one thing to recognize that the voice of fear is not from God, but it is another thing to know exactly what to do about it. I mean, being scared is not really just something one can "turn off," right? I knew God's voice is calling me to open my body and my heart to our two remaining snowflakes, but I didn't really know how to stop fearing the possibility that we could loose them again. Show up to the appointments, the injections, the daily handful of vitamins and pills. Show up to the moments of hope or prayerful pleading. Show up to scary unknown future as it slips into the present. 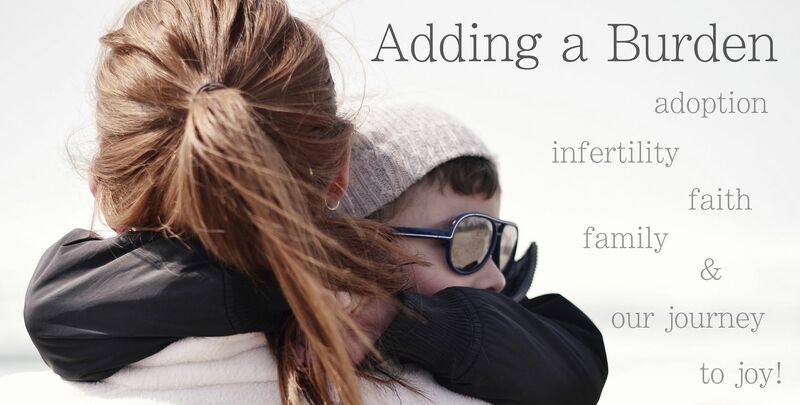 Show up to hear the questions from my little boy who wants to be a brother, to see the mixed look of love and concern in my husband's eyes, and to feel each step of ascension and decline of my heart. Be scared, sure. But show anyway. This week I noticed that as I've determined to show up scared, the fear has been waning. I've moved from I don't think I can do this to Can I do this? to I'm doing this. Last week I was shopping for my niece, due to arrive in April, and while I examined little dresses for her in flowers and pinks I came across the most precious little sleeper: striped in neutrals, soft in cotton. I stared at it not because I knew my sister-in-law would love it for her daughter, but because I loved it. For my baby. I did something that surprised me: I bought it. A symbol of the hope growing in my heart: hope that the soft striped cotton of that sleeper will one day wrap warmly around the tiny body of my child. Hope that someday I will dress my baby in it, remembering how scared I was that he or she would never come. And how grateful I was that I showed up, even scared. I wish I knew the future. I wish I knew that hope would be fulfilled. I don't. So instead I look to the One I do know. The One who has called me on this journey, unexplained as it may be. The Shepherd whose voice I know. Who calls me to reject the voice of the stranger who comes to destroy me with fear and apprehension. I look to the one who promises not only life, but life to the full. I follow him, scared but assured, uncertain but hopeful, longing but not alone. We are also feeling anxiety, we just started the snowflake adoption application process. Praying for you, hope the transfer is successful! Congrats on starting the process Catrina! Thank you for your prayers! I hope God gives you peace on the journey! Oh Jill. Praying for you. I did the same thing. I bought a sleeper years and years ago. 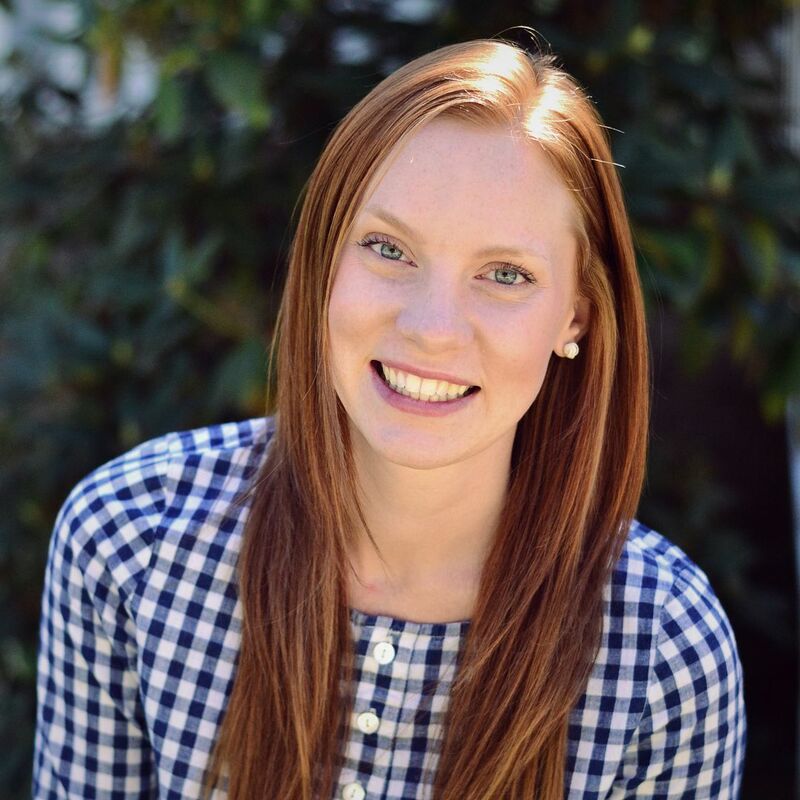 After struggling g with infertility and feeling anxious and often defeated. In that moment, standing in target, I felt hopeful and embraced it. I bought the sleeper. Even in our darkest days, even after miscarriages, in the moments I was sure I'd call it quits, I held on to that sleeper. In 2006, after neat 10 years of trying, my little girl wore it. I pray you see your baby in that sleeper soon. Beautifully written and expressed - praying for you Jill! Just experienced our first miscarriage and am sensing a lot of the same emotion as we begin to think about trying again. I can only imagine the range of emotions you've been through, but praying with you all the same!